Why are people using the retarded media label of "drone" for interconinental tropedoes? The-thing-next-door wrote: Why are people using the retarded media label of "drone" for interconinental tropedoes? Because unlike torpedo, it operates independently once launched and can be controlled more efficiently. Explosive payload is option for any drone so that doesn't factor in definition. One showed the underwater nuclear drone, which Putin announced did not have a name, and that people were welcome to submit their suggestions to the defence ministry website. During Gen assembly speech VV Putin asked Russians to suggest names for new weapons. One of them is. Tadaam - underwater,nuclear powered drone, with intercontinental range. does it ring the bell? So Status-6 officially confirmed. BTW it looks like nuke torpedo can also attack ships...being on 1 km depth makes it invulnerable against and existing ASW stuff. 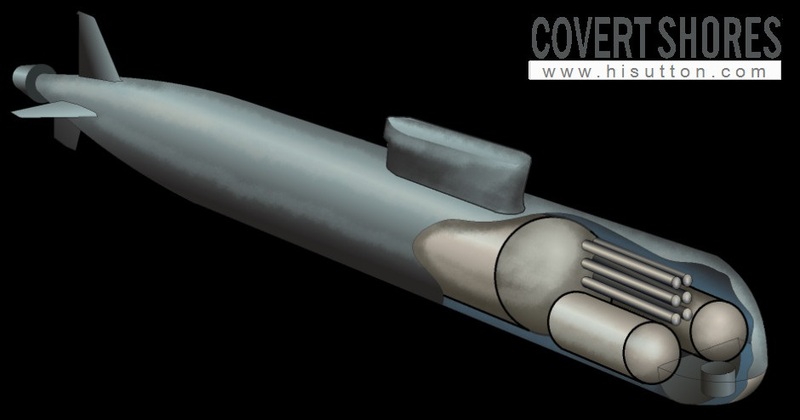 Another interesting issue is which type of submarine will carry this drone/torpedo. Maybe a modified Oscar class (from the video submarine resembles Oscar class more) ?? To get it and "become operational" are two different things, especially in Russia. They will get it and it will be operational, according to TASS. Those are two different things in US, which starts fitting the ship out after official commission, while Russians commision the ship only after it passed all the tests and it's 100 % ready. verkhoturye51 wrote: They will get it and it will be operational, according to TASS. That´s what i wanted to say. The first drones are propably already delivered. They will test them, improve them, develop manuals and so on. And navigation will also be a project itself. How do you make a remote control for nuclear powered torpedo that can dive to a 1000 m depths and travels at high speed between underwater reefs? I suppose the max depth can be reached only in deep water...unless they install some kind of artificial intelligence that will use active sonar and communicate back to engine and rudder. Quick question, is it possible to put an FOAB in the Poseidon, and export it as some sort of Poseidon-E? verkhoturye51 wrote: And navigation will also be a project itself. There will be no remote control, it will operate independently. Once it on it's on, no going back. AlfaT8 wrote: Quick question, is it possible to put an FOAB in the Poseidon, and export it as some sort of Poseidon-E? Not an expert so cannot answer authoritatively, but the "FOAB" is a thermobaric bomb, it needs air to explode. So no underwater explosion unless I am missing something. The yield is supposedly 44 ton TNT so also not too much. And since this weapon is of strategic nature and contains highly sophisticated compact nuclear propulsion and guidance, I would very much doubt that there will be an export version any time soon. It would be interesting to know the power of the nuclear engine of this thing. You could use it on diesel subs either to make air from water or put two of those to propulse the sub for great distances but outside of the hull. 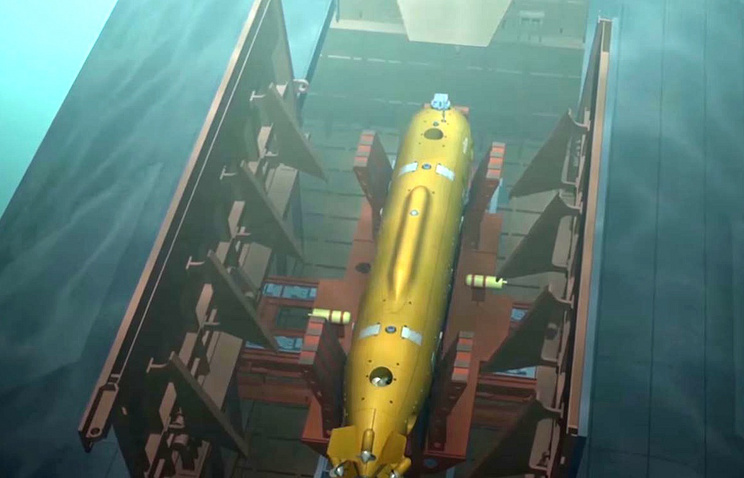 The Russian Navy until 2027 will receive underwater nuclear drones "Poseidon"
Unmanned underwater vehicles Poseidon equipped with an atomic power plant will be delivered to the Russian Navy until 2027 as part of the state program. Their carrier will be the nuclear submarine being built on Sevmash. As reported by TASS with reference to a source in the defense industry complex, the Poseidon system will include several high-speed deep-water torpedoes with a small nuclear power plant. According to the interlocutor of the agency, the future submarine will not be a submarine of the 5th generation "Husky". At present, the Russian Navy includes three strategic nuclear submarines of the Borey type (Project 955) - Yuri Dolgoruky, Alexander Nevsky and Vladimir Monomakh (the first in the Northern Fleet, the other two in the Pacific Fleet). They are equipped with solid-fuel intercontinental ballistic missiles "Bulava", each submarine is capable of carrying up to 16 such missiles. Another five nuclear submarines of the Borey-A type are currently under construction. The last ship of this series, "Prince Pozharsky", was laid in December 2016 . Among other things, the Russian fleet has one multipurpose submarine of the type "Ash" - "Severodvinsk" (Northern Fleet). The Navy received it in the summer of 2014, but until the spring of 2016 the submarine was in trial operation. I wonder which sub will be basis for carrier? Losharik2? I don't know which one it will be but this Poseidon thing is way too nasty to be just 'one of' weapons on anything. Whichever ends up carrying it it will be that vessels primary (and pretty much only) weapon. So if Husky is out then that eliminates Yasen. I doubt that Yasen will be getting it for the same reason as Husky won't: they are needed for other stuff. So we are down to one of Boreis, Oscars or maybe Delta if they have one in good condition. Boreis are in regular use and both Oscars and Deltas are a stretch because 2027 is close to their expiration date. 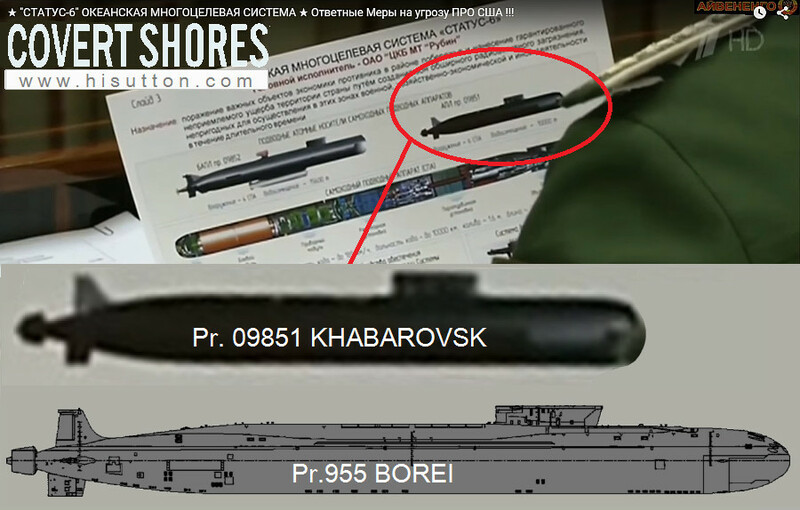 My guess is that given that there is still decade away they might build barebones orginal Borei sub modified specifically to carry these nuclear drones since they have enough time in that case and original version should be cheap enough at this point. But why would they even need submarine to carry these drones? They might as well deploy them from coastal bases since they don't have range limit..
PapaDragon wrote: But why would they even need submarine to carry these drones? They might as well deploy them from coastal bases since they don't have range limit..
perhaps location near Galapagos will make harder to spot (remember this is also against CVNSGs not only LA or NYC) or time to travel to nearest coastal city/base also counts? anyway I think it will be a special sub - going deeper or moving faster. Especially that US will let hundreds of detection drones to constantly monitor oceans in potential "problem locations"
What do you mean moving deeper and faster? The torpedo itself will be "excessively" fast and will have a max depth of 1000 m. And it couldn't be possibly more detectable than a submarine. Howevere a giant torpedo, moving accross Pacific is perhaps worse idea than sending submarine, which gets as close to US as possible and then launches it to leave no time to prepare. PapaDragon you're damn right no Borei will carry the baby - they're building a special submarine just for this missile - mysterious Khabarovsk. Now that you mentioned Khabarovsk I checked one of our go-to sources and they dropped several updates. TWICE the length of Bulava!!! So this monster is not only large enough to carry nuclear reactor, it's large enough to keep the noise down as well. They are small enough to be easily moved around and rotated regularly. And there is no shortage of locations to base them, especially in the Arctic. No way to cover all that. I think that they went with submarine as launch platform because they don't want to keep 100MT salted nuclear warheads in their own backyard any longer than necessary. Better to keep them far away at sea for most of the time where they are someone else's problem should something unexpected happened. Besides, submarines sound scarier than shore bases. verkhoturye51 wrote: What do you mean moving deeper and faster? Losharikn depth is like 6000m, is you can build platform diving 1000+ this is actually hard to detect and same time not reachable to existing anti-sub weapons. The torpedo itself will be "excessively" fast and will have a max depth of 1000 m. And it couldn't be possibly more detectable than a submarine. However a giant torpedo, moving accross Pacific is perhaps worse idea than sending submarine, which gets as close to US as possible and then launches it to leave no time to prepare. A carrier which is wherever you might not expect it is also deterrent you need much more resources to defend form all possible directions then only from shores of Russia. Imagine south of Atlantic - or Indian. ocean. All bases / carrier groups are in a "continuous anxiety state"
I wonder from where is this 100MT?is this weight limit fr thermonuclear bomb? wiki says 6 MT/ton . Car bomb was 27tons and could yield 100MT. This will not be used against fleets, this is third strike weapon. A city killer (subcontinent killer actually).